I recently bought a new (well, refurbished actually) laptop for writing. I decided to try to use as much open source/free (not pirated) software as possible. I use Scrivener, but that does require a one-time license purchase. I've installed LibreOffice, Inkscape, GIMP, and Scribus. For those aren't familiar with the programs, they are free, open-source "versions" of Office, Illustrator, Photoshop, and InDesign respectively. Hopefully, with a slightly more powerful machine than my 8 year old MacBook, I might actually post a few adventures online soon. Layout in programs like inDesign has never been my wheelhouse, so I am trying to learn Scribus now. (I have a passing familiarity with GIMP). For those who are interested, I recommend taking a look at this video. 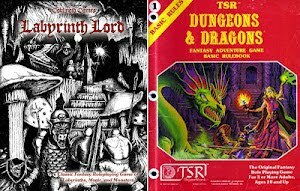 I don't know about the rest of you, but I find it pretty darned cool that they are powerful programs like these out there for free to use with OGL games like Labyrinth Lord so it's that much easier to enjoy this hobby. "Echoes" has been a bit quiet lately. Part of that is due to my not actively gaming for the last couple of months, and partly because I've been mucking about on another blog of mine that I started a while back for a more specific gaming purpose. The Zarth Tourism Bureau is a pulp/swords & sorcery related blog mostly (but not entirely) about the new "Crypts & Things" game and things of that ilk. This blog is still the home of more general FRPG nerdery.